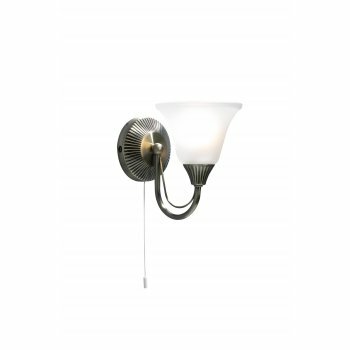 Dar Lighting Boston single light wall fitting features an acid etched glass shade mounted on a curved antique brass arm supported from a circular wall plate. The product code for this product is BOS07, variants are available in the form of a 2 light wall fitting and ceiling fittings. This fitting is available in antique brass "BOS07", however a similar style in polished chrome "DER07" variant is available to order from our Derwent collection. Operated by a pull cord switch located on the back plate. Our range extends to 3 semi flush ceiling fitting "BOS03" and 5 light semi flush ceiling fitting "BOS05", 2 light wall fitting "BOS09", table lamp "BOS40" and floor stand "BOS49" all of which are available to order online. To view all of the above product type the product code into the search box, or search "Boston" for access to the full range.